Contractors working on a £200m renewable energy plant in Hull have been sacked after "significant delays". Energy Works said it terminated its contract with MW High Tech Projects UK Ltd, which was involved in building the facility on Cleveland Street. The project, which the developers claim will generate enough electricity to power more than 40,000 homes, was expected to be running by January 2018. MW High Tech Projects UK declined to comment. In a statement, Energy Works said: "It's a decision that we have taken with great reluctance. "The decision comes after, amongst other things, significant delay to the works. "We will implement shortly a recovery plan to continue with the works. "This move guarantees the future of the plant, and we look forward to continuing to process waste and produce renewable energy for the people of Hull." The company claims more than 240,000 tonnes of commercial and domestic waste a year will be turned into gas, which will then be burnt to generate electricity. 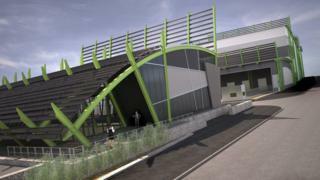 It is being built on an eight acre site by the banks of the River Hull. Almost £20m of funding came from a grant by the European Union. Other funding came from Bioenergy Infrastructure Group, a group made up of UK investors and US, German and Israeli investors.